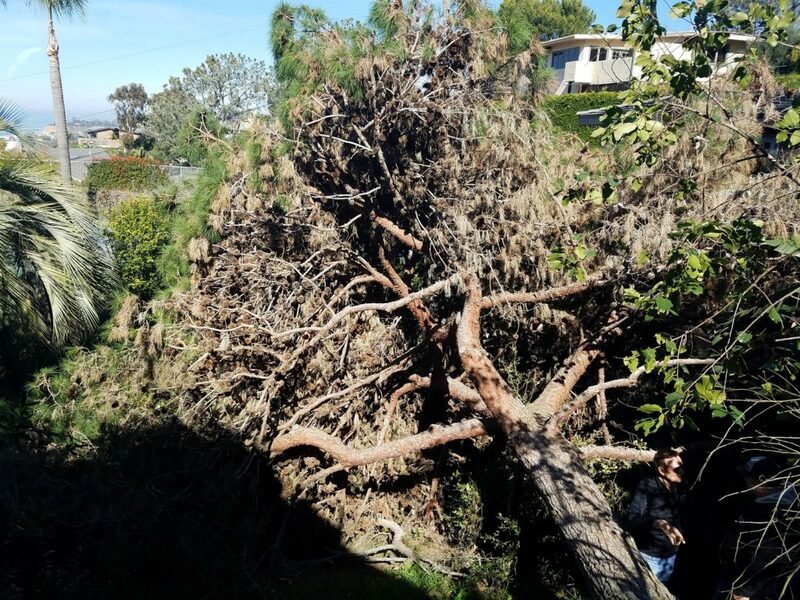 In February, after some of San Diego’s wildest storms in years, we received a call for tree removal of a 45′ Pine Tree situated on a slope between two very nice houses in Del Mar. 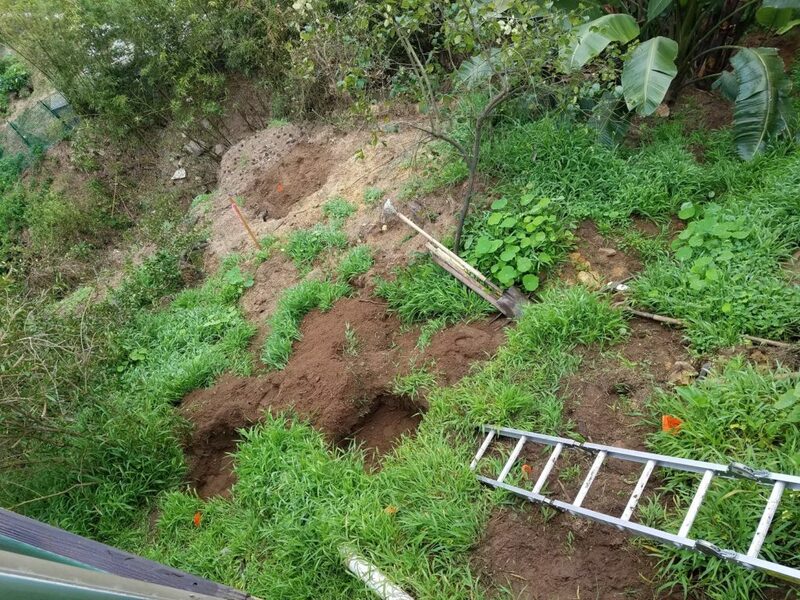 The pine was uprooted and had fallen down the slope, taking out a large nearby Acacia Tree. We removed both of the fallen trees, however there was now nothing providing privacy between the two houses. The homeowner asked for recommendations for tree planting on this back slope area. He obviously wanted to regain his privacy and that of his neighbor. The homeowner wanted trees with a fast growth rate that wouldn’t require too much maintenance, and that would spread nicely to provide a nice privacy screen. After several recommendations, the homeowner decided on having us plant four Camphor Trees, which is great! 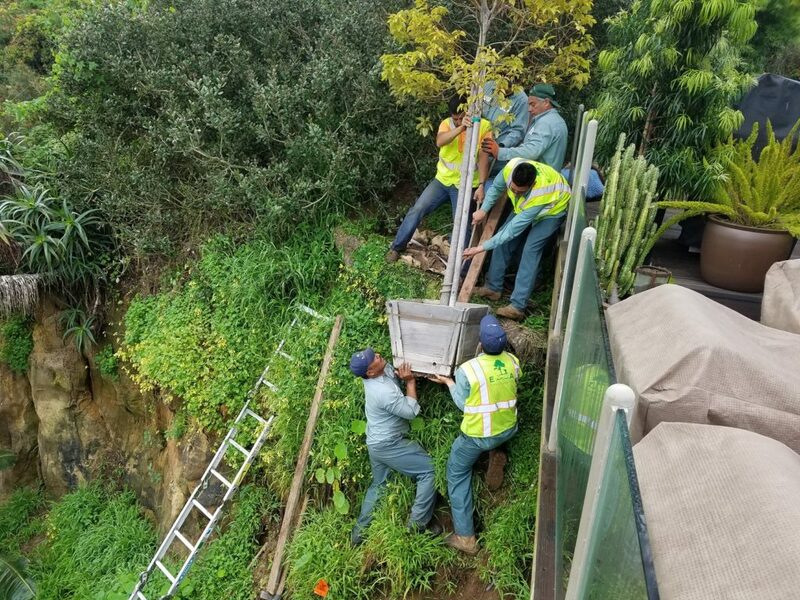 We perform tree planting all the time. 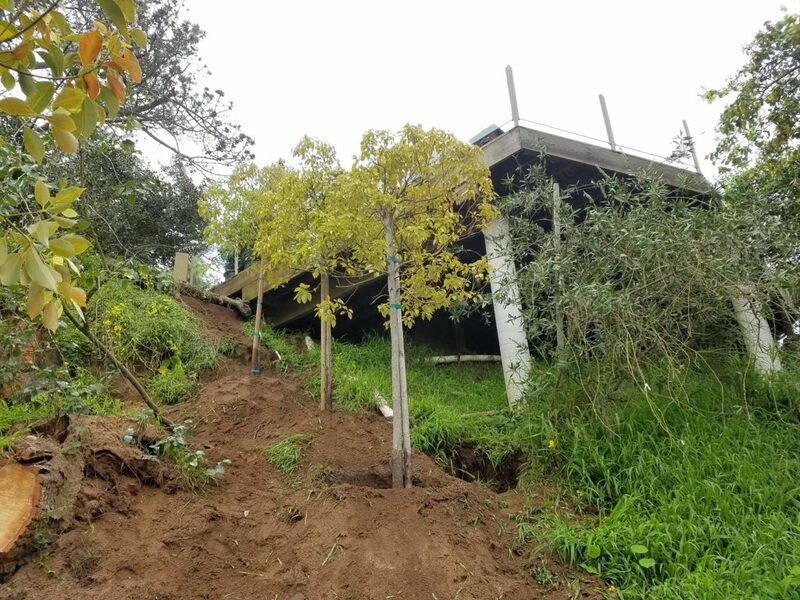 The problem, however, was that the trees needed to be planted on the slope, 12′ below the home’s raised deck. Over the side of the deck was our only point to access the slope, so the trees had to be lowered from the side of the deck down to the ground below. 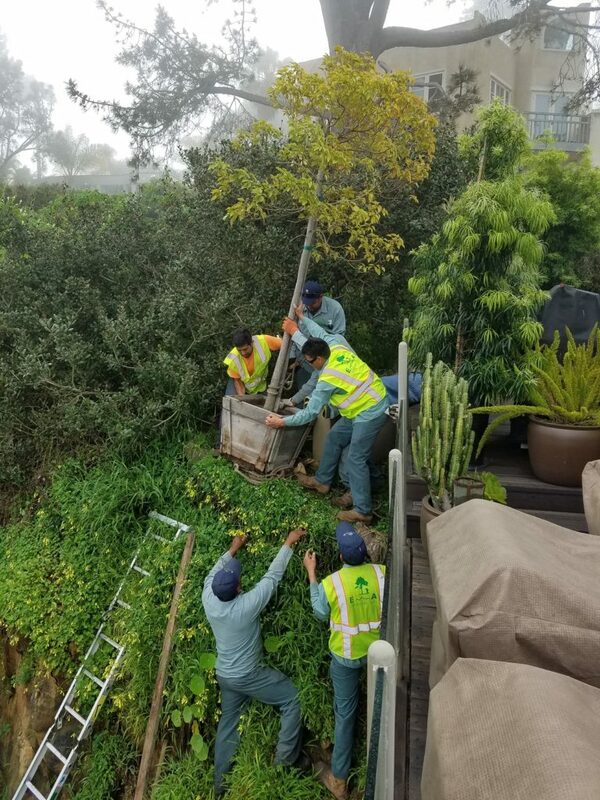 So even though the homeowner would have preferred to start with larger trees, the largest size we could feasibly get to the planting site would be 24″ box size trees. 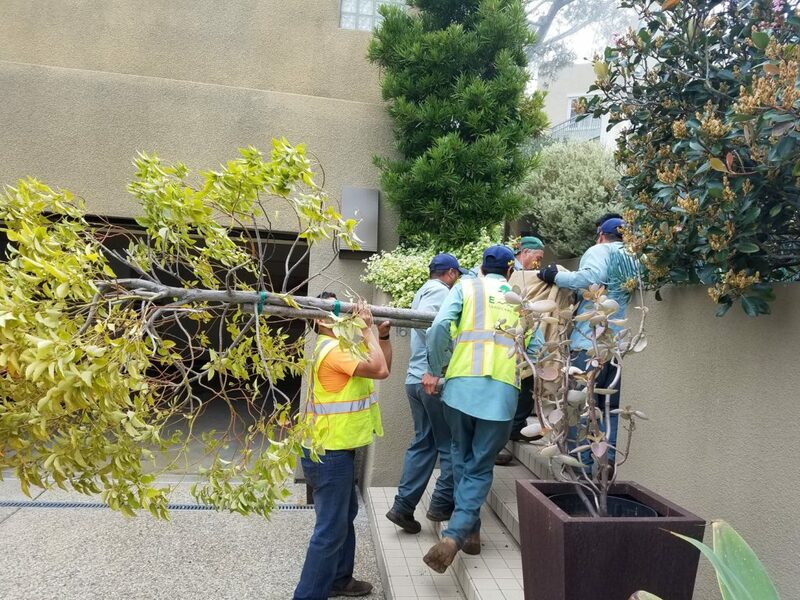 With six of our technicians on hand, we carefully carried the trees up the steps and around to the back of the house. We then lowered the trees over the side of the deck and down to the planting sites below. Over the next few years, the trees will grow at a rate of 1-2′ per year and spread out nicely to provide the privacy that the homeowner is trying to regain. 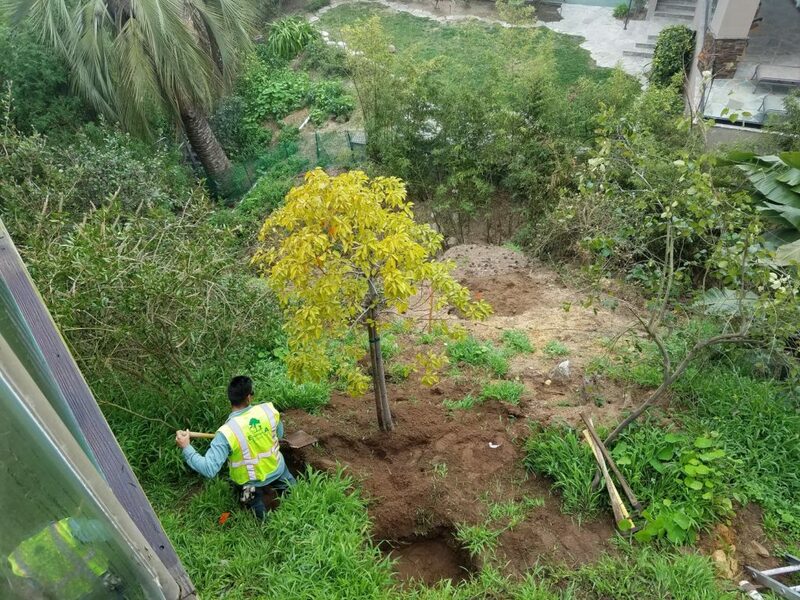 We also planted a 24″ box Toyon Bush and performed tree trimming on another large Pine Tree. At the end of the day, the homeowner was happy with the trees and the outstanding work of our technicians. If you need tree planting, tree trimming or tree removal, call us for a free consultation and estimate.